The market is segmented by Aircraft Type (Fixed-wing Aircraft and Rotary Aircraft), and Geography. 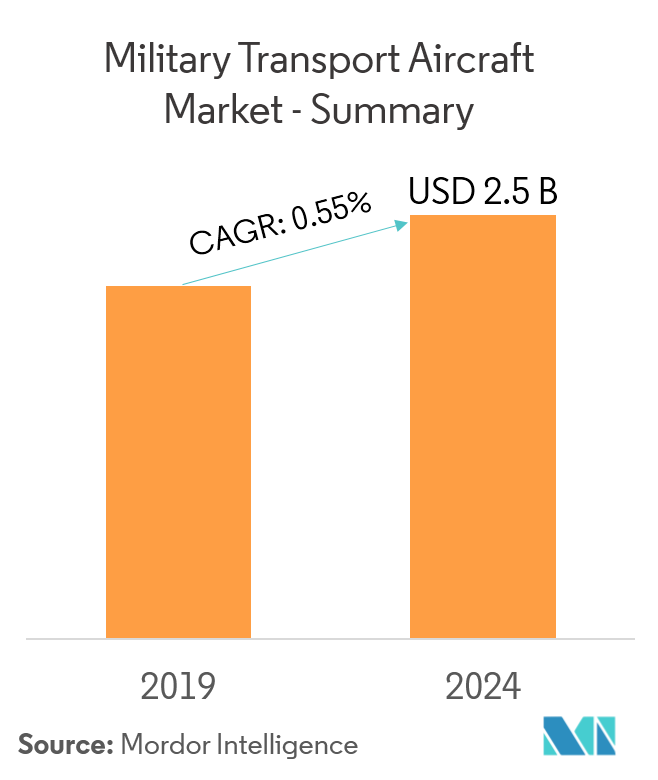 The military transport aircraft market is anticipated to register a CAGR of over 0.5% during the forecast period, 2019-2024. The market is expected to reach a value of USD 2,486.91 million by 2024. 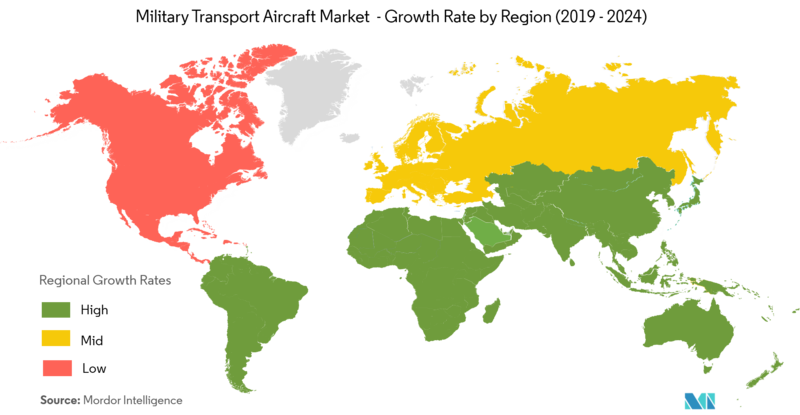 Growing defense spending in Asia-Pacific and the Middle Eastern regions. The market is also driven by the need for replacement of the aging fleet of transport aircraft, as few countries have aircraft that have been operational for over 50 years. New aircraft programs, such as Ilyushin Il-112V, Xi'an Y-20, and Antonov An-188 can generate demand, as countries look for aircraft with advanced features. Military cargo aircraft or transport aircraft are typically fixed wing and rotary wing aircraft that are used to carry troops, weapons, and other military equipment to any area of military operations across the world. Some military transport aircraft perform multi-role duties, such as aerial refueling, as well as rescue missions, and tactical, operational, and strategic airlifts onto unprepared runways. Transport aircraft modernization has been included in the report. Fixed-wing transport aircraft are defined usually by their range, payload, role, and speed. Fixed-wing transport aircraft are used for transporting fuel to support aerial refueling of fighter jets that have a limited flight endurance. Smaller military cargo aircraft are often used to transport military communications equipment as permanent or temporary platforms, or even as an air ambulance. Countries, such as the United States, India, Russia, and the United Kingdom, are currently considering newer generation fixed-wing aircraft to replace its aging fleet or to expand its current fleet size. Growing defense budget allocation is likely to support the motive of the armed forces of these countries to purchase these new aircraft in the near future. In the past year, the United States launched a congressionally mandated study in order to determine the number of military transport aircraft they require for supporting future military operations in the country. China and India play a major role in generating a huge demand for military aircraft in the region. Currently, both these countries are among the top five defense spending countries in the world. India is also considering to upgrade the Avro Hawker Siddeley HS748 fleet of transport aircraft. India also plans to replace a few aging transport aircraft with new C-295 aircraft. Over the years, China has successfully designed and developed its own heavy military transport aircraft Y-20. Recently, China Air Force received a batch consisting of five Y-20 aircraft. China is also expanding its special mission versions of Y-9 aircraft. Likewise, Japan also has 17 V-22 Osprey aircraft on orders, which are expected to be delivered during the forecast period. New Zealand also plans to replace its aging fleet of C-130J aircraft with KC-390 aircraft in the next few years. Increasing orders are likely to propel the Asia-Pacific military transport aircraft market to grow at a rapid pace during the forecast period. 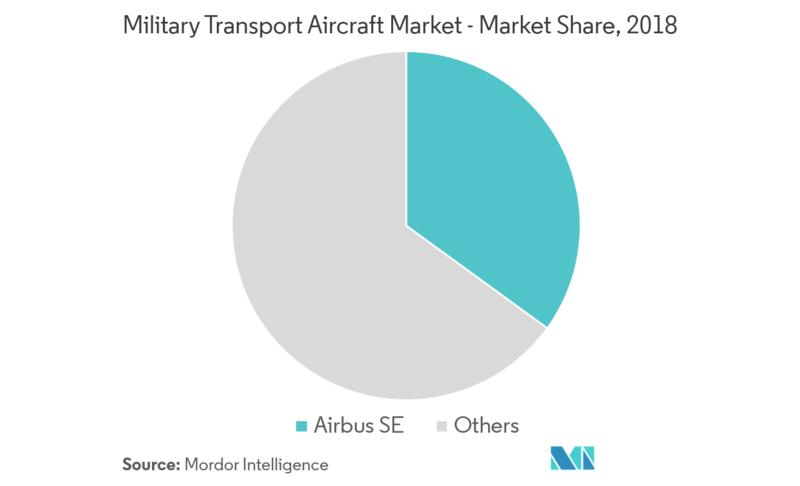 The military transport aircraft market is highly competitive, and it is currently dominated by Airbus, as the company's portfolio includes both fixed-wing and rotary military transport aircraft. 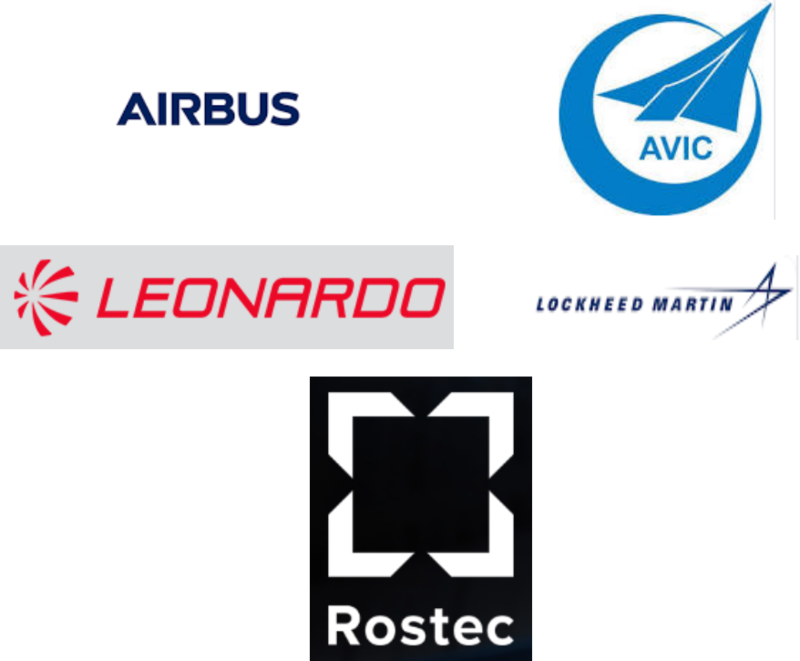 Some of the other prominent players in the market are AVIC (China) and Rostec (Russia). The market for transport aircraft has the potential to grow steadily over the next decade, as several countries are looking to replace their aging fleet of transport aircraft. Players are competing based on their newer generation military transport aircraft. Some of the players, like AVIC, have also increased their production rate to meet the growing demand.